There are often problems associated with how natural history museums traditionally collected and displayed artifacts. The history here actually ends up being a great example of how culture and social norms and influence how we think about science. The facts may not change, but our interpretation of them does. 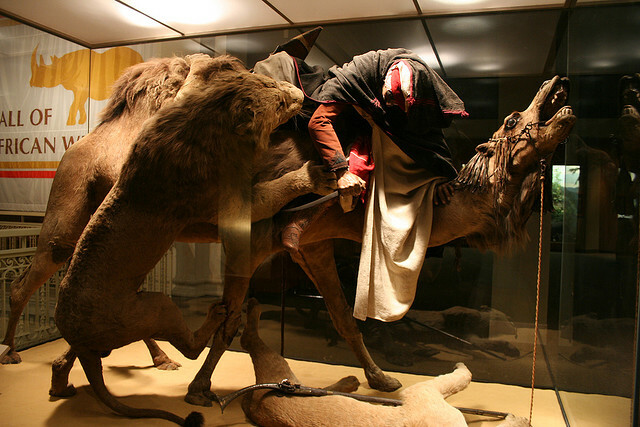 For instance, the Dyche Museum at the University of Kansas, my childhood natural history museum, owns the taxidermied body of a U.S. cavalry horse that was the only member of the 7th Cavalry to survive the Battle of the Little Big Horn. For decades, this horse was billed as "the only survivor of the Battle of the Little Big Horn." Which, for obvious reasons, is both wildly inaccurate and pretty racist. *The AMNH, while acknowledging the skill it took to produce a diorama like this, wasn't quite sure it lived up to their standards as a display of scientific educational value. **Yes, there is something a little weird about snow falling on this scene. Image: Flickr user happy via, via CC license.